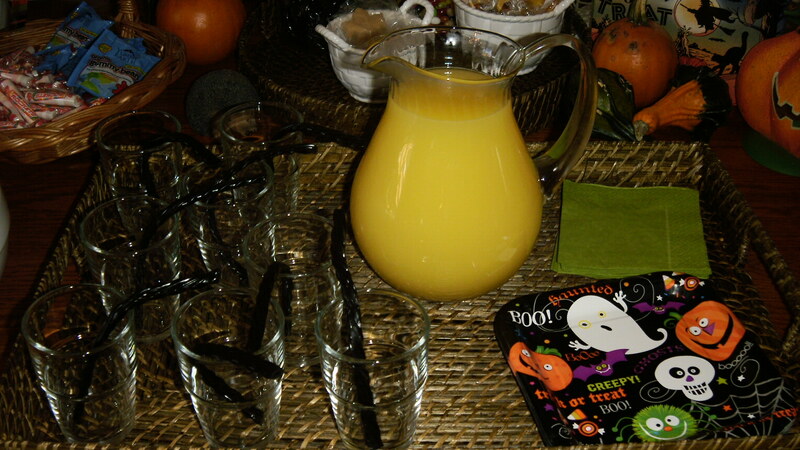 Posted on October 25, 2011 by Susan H.
Our Allergy Friendly Pre-Hallowe’en Party was ‘Spooktacular’! 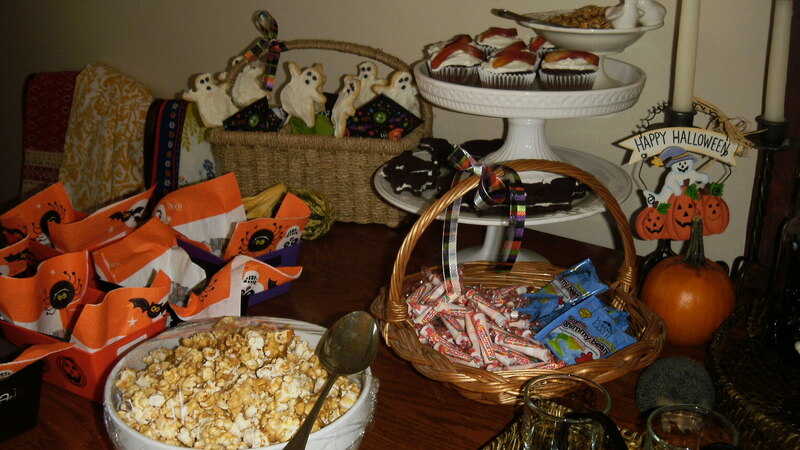 I put together an assortment of goodies and treats for my neighbourhood ‘taste testers’ to sample….and sample they did! Hope it didn’t spoil anyone’s dinner! 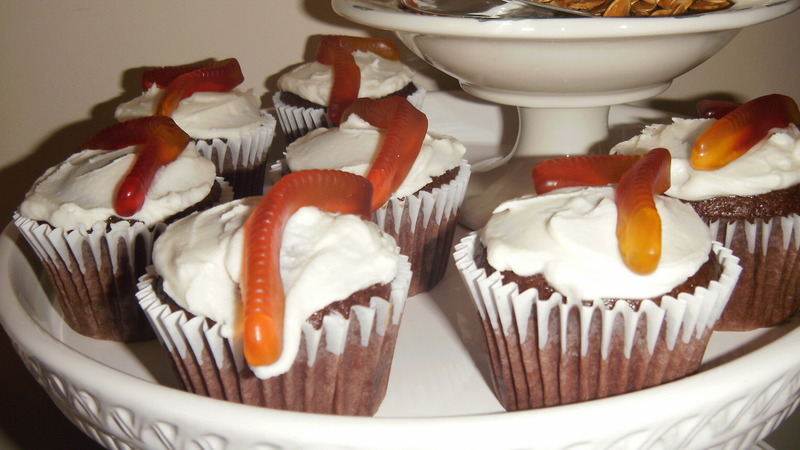 Dairy, Egg and Peanut/Tree Nut Free Chocolate Cupcakes topped with Dairy Free Vanilla Icing and Surf Sweets Gummy Worms. Michael loved these the best! It’s my Dairy, Egg, Soy and Peanut/Tree Nut Free Chocolate Cake recipe halved. The cupcakes are baked at 350 F for 20-25 min. My Dairy Free Vanilla Icing tops them off. 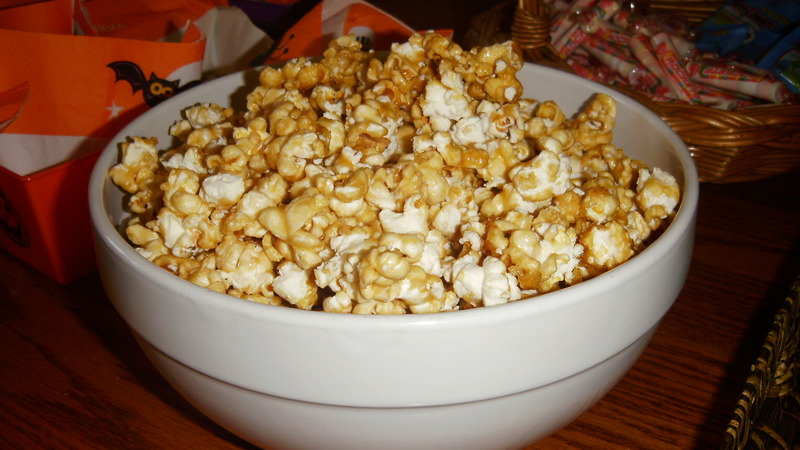 Dairy Free Caramel Corn, recipe from Speedbump Kitchen. This is the first time I have ever made Caramel Corn. Very easy to make. It takes a bit of time, but the looks on the kids faces as they ate it was all worth it. Roasted Pumpkin and Squash Seeds, recipe from The Toronto Star by Jennifer Bain (Food Editor). Every year I like to roast pumpkin seeds saved from carving the pumpkins. Michael and I love them. Last year, I experimented by roasting seeds from Acorn and Butternut Squash with great success. I like that there is no waste as I also roast the squash. 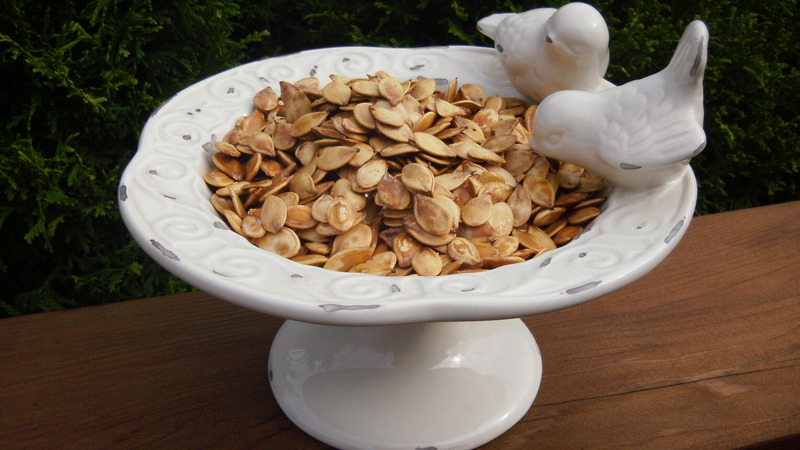 For this recipe, I used a Pie Pumpkin’s seeds to roast. I cooked the peeled and chopped pumpkin in boiling water until tender. Mashed the cooked pumpkin and stored it in a covered container in the refrigerator. I am in the process of choosing a recipe to use it in: Healthy Pumpkin Muffins or Pumpkin Bundt cake? Please let me know in the comments below. 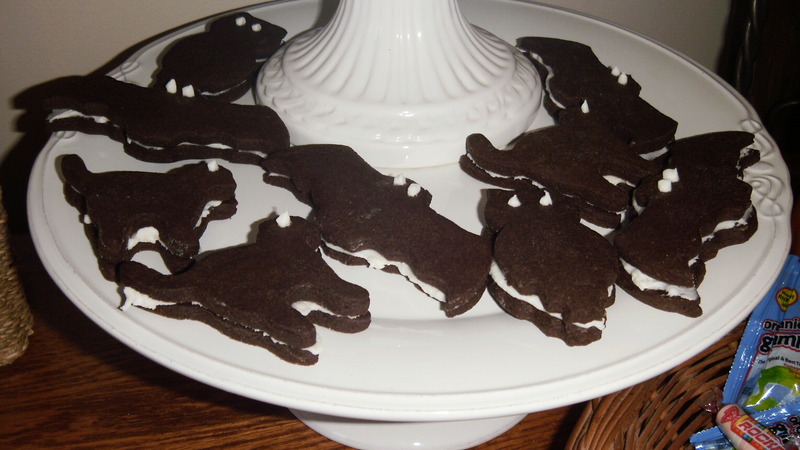 Dairy, Egg and Peanut/Tree Nut Free Chocolate Bat, Cat and Owl Sandwich Cookies recipe adapted from Everyday Food Magazine. 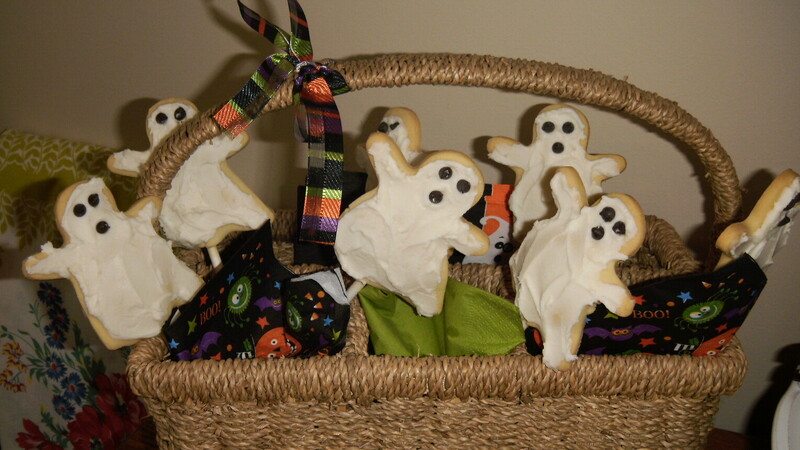 Dairy, Egg and Peanut/Tree Nut Free Ghost Sugar Cookies on a stick. I will be posting a step by step recipe for the Dairy, Egg and Peanut/Tree Nut Free Sugar Cookies on Friday. Click here for the recipe. 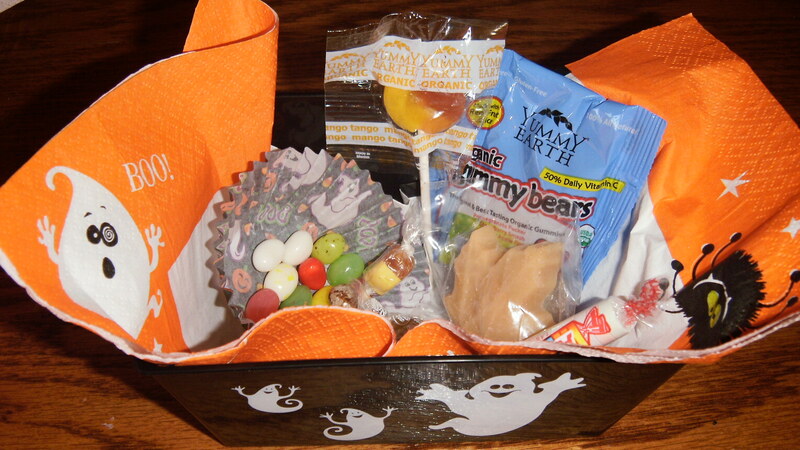 Gimbal’s Jelly Beans,Yummy Earth’s lollipops and candy drops Twizzler’s Black Licorice, and Maple Sugar Candy. 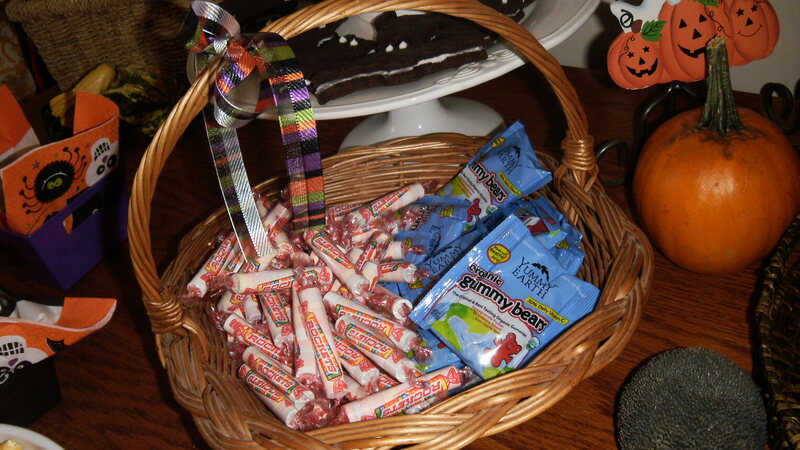 All the kids, except Matthew, were enchanted by Gimbal’s Jelly Beans with 41 flavours. They loved trying to figure out what jelly bean they had from the flavour guide on the original container. Buttered Popcorn and Cinnamon were among the unpopular flavours. All the fruity ones were the top picks. Rockets and Yummy Earth Gummy Bears in individual packets. Michael made up some Five Alive and snipped both ends of Twizzler’s Black Licorice for straws. They look better than they actually work! I found these great containers and napkins at a dollar store. The kids were able to take home a few goodies in them. 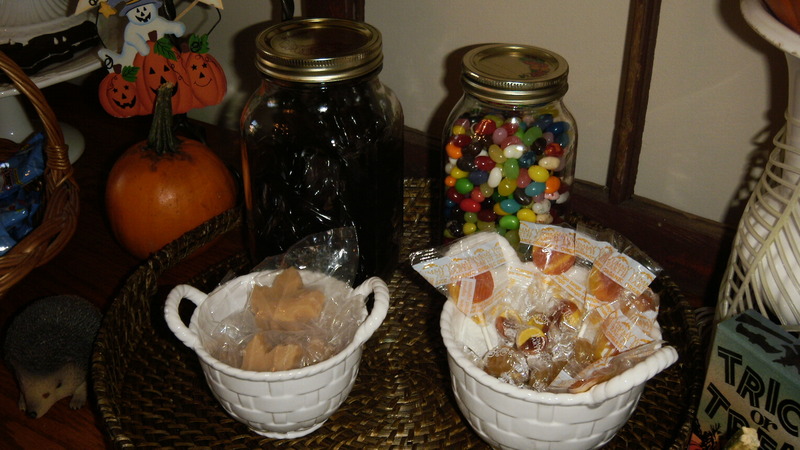 Tip: Once in a while, I will find Yummy Earth and Gimbal’s candies at Home Sense. Our Foodland is now selling small packages of Yummy Earth lollipops and I have found Surf Sweets candies at my local FeelGood Natural Health Store. This entry was posted in baking, dairy free, dessert, egg free, Hallowe'en, peanut/tree nut free, sesame free and tagged allergy friendly hallowe'en baked goods, allergy friendly hallowe'en candy, allergy friendly hallowe'en party, dairy egg and peanut/tree nut free chocolate cupcakes with dairy free vanilla icing, dairy egg and peanut/tree nut free chocolate sandwich cookies, dairy egg and peanut/tree nut free ghost sugar cookies on a stick, dairy free caramel corn, roasted pumpkin and squash seeds by Susan H.. Bookmark the permalink. This is all just SO awesome! Your kids are so very lucky to have such a great mom! It all looks delicious!! Yum! Thanks Carla! It’s a win/win situation…I love being creative…and they love trying what I create! ~ Susan H.